To maximize glycogen resynthesis after exercise, a carbohydrate supplement in excess of 1.0 g · kg-1 body wt should be consumed immediately after competition or a training bout. Continuation of supplementation every two hours will maintain a rapid rate of storage up to six hours post exercise. 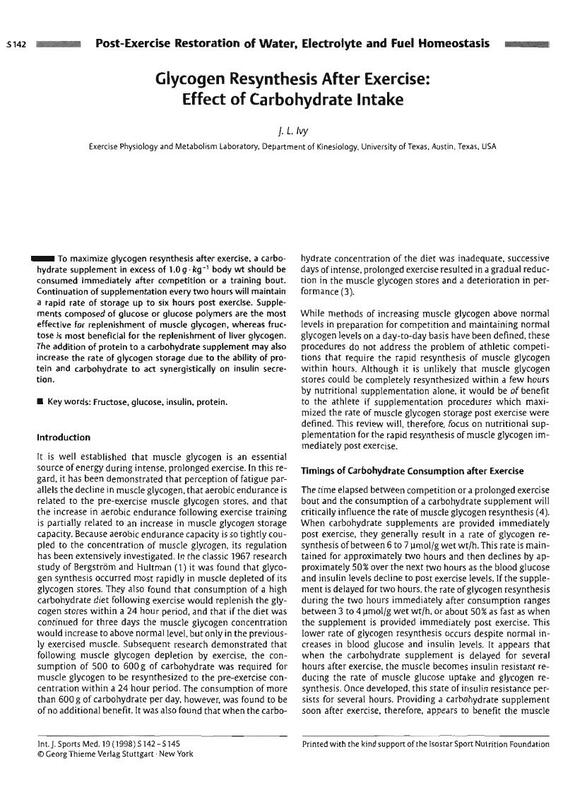 Supplements composed of glucose or glucose polymers are the most effective for replenishment of muscle glycogen, whereas fructose is most beneficial for the replenishment of liver glycogen. The addition of protein to a carbohydrate supplement may also increase the rate of glycogen storage due to the ability of protein and carbohydrate to act synergistically on insulin secretion.